For the second year running, the UK based organization Action for Charity, organized the Women Vs Cancer Cycle Ride. The challenge called on 40 women from the UK to travel to Kenya, to cycle 400kms in 5 days, from the slopes of Mt Kenya to the shores of Lake Victoria. 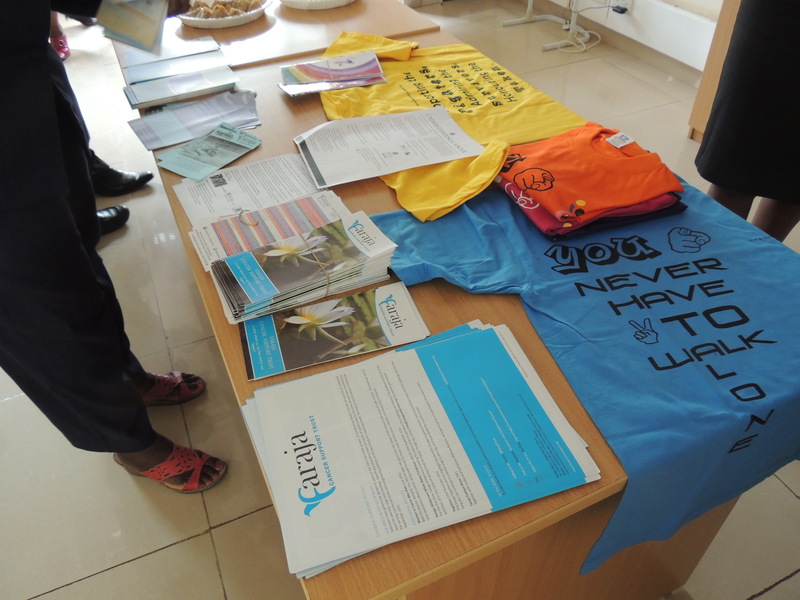 Each of the 40 women from UK raised funds for three cancer charities, with Faraja Cancer Support Trust being the local Kenyan charity that benefits from a proportion of their funds raised. 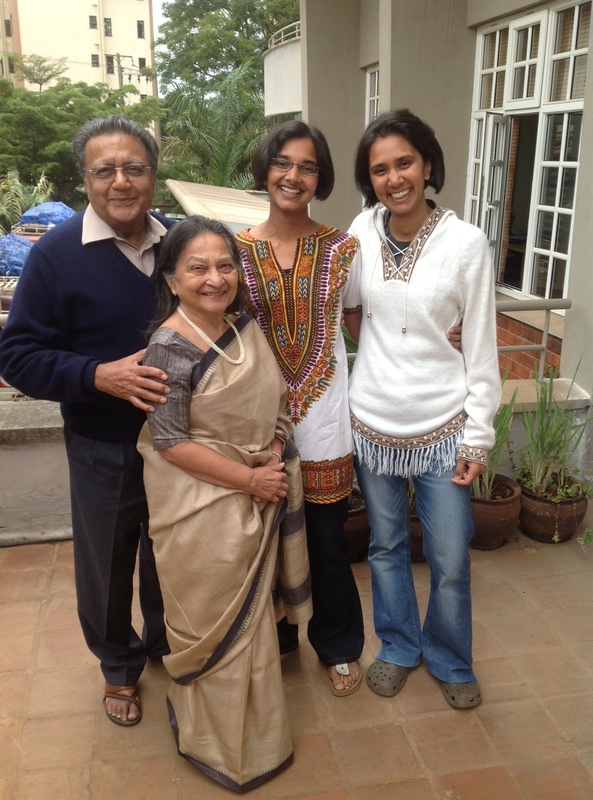 At the last minute, just a few weeks before the start, two spirited young Kenyan ladies – Deepa Sumaria and Sheena Malde – decided to join the challenge, and to raise money specifically for Faraja Cancer Support Trust. Deepa and Sheena took up the challenge with enormous energy, and in just two weeks managed to raise Kshs 1.2 million from generous donors. The cycle was a huge success; its route snakes through some of Kenya’s most rural areas, and each village passed means more awareness raised about cancer. The weather this year posed an additional challenge for the cyclists; rain and cool winds meant that it was a much colder cycle than last year which was hot most of the way. After five days of grueling cycling, up steep hills and down into valleys, the group arrived on the shores of Lake Victoria, to stay in Kisumu. 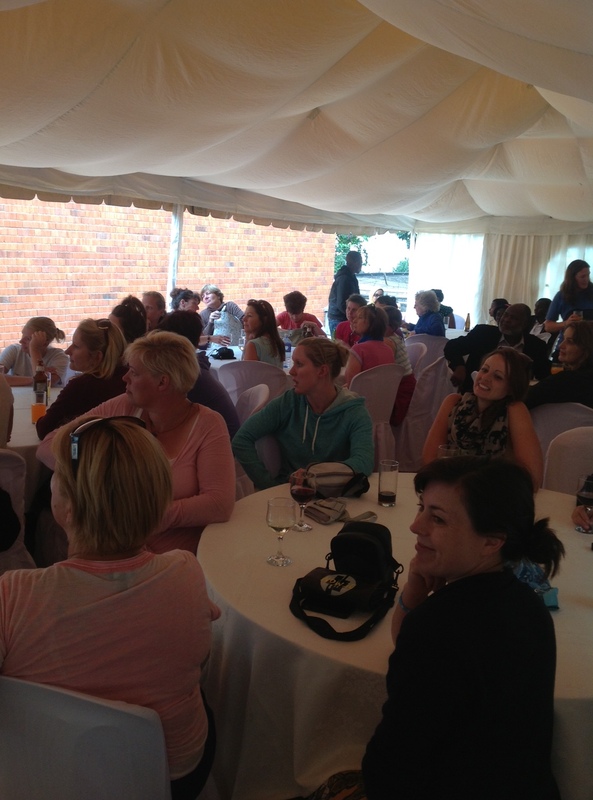 After a restful night, the group returned to Nairobi where Faraja Cancer Support Trust put on a buffet lunch and entertainment before the ladies departed back to the UK. Faraja Cancer Support Trust wishes to thank Action for Charity for once again supporting them through their fundraising efforts. Action for Charity raised GBP 3,000 for Faraja in total. Deepa Sumaria and Sheena Malde also deserve hearty thanks and congratulations for their last minute fundraising efforts and energy in getting involved with the cycle. For more information on Faraja Cancer Support Trust: www.farajacancersupport.org. For more photos of the Ride, click here. 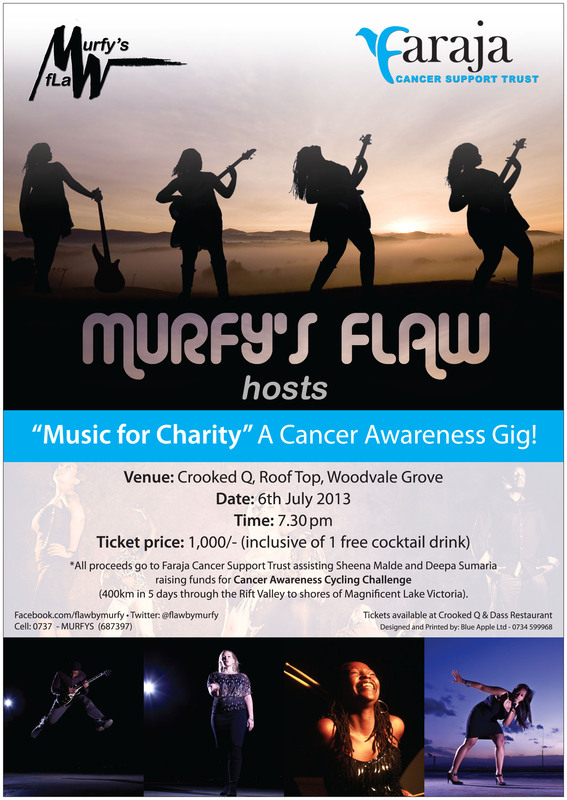 Check out the band Murfy’s Flaw at the July 6th fundraising show to support Faraja Cancer Support Trust. Click here for more information! There is much debate and controversy over the impact of food and environment on human health. The documentary Forks Over Knives examines the profound claim that most, if not all, of the degenerative diseases that afflict us can be controlled, or even reversed, by rejecting our present menu of animal-based and processed foods. View the documentary’s trailer here. Hope and Courage International took 25+ people out on Saturday, June 22nd for the Oloolua Cancer Walk – combining exercise and fresh air, with cancer awareness and advocacy. See these photos and you’ll see that it looks like fun was had by all! On June 20th Africa Cancer Foundation, in partnership with the Medical Society for Action Network launched a three-week cervical cancer awareness curriculum at Mary Leakey Girls’ Secondary School. Click here to see photos from the day. Margaret Muthura of Africa Cancer Foundation reported that the girls were very eager to learn! The Network partner organizations also discussed the KENCO organizational structure and made great strides toward formalizing this informal networking/advocacy body, so that it will have a firm structure for moving forward and pushing for cancer control as a united front. Many thanks to Faraja Cancer Support Trust for hosting today’s meeting!